Will Tesla Be Able to Produce the $35,000 Model 3? Questions are mounting on whether Tesla can profitably produce the $35,000 Model 3. One of the longest-running debates on Tesla Inc. (TSLA - Get Report) has been whether the automaker will be able to produce the $35,000 base Model 3 -- or at least, will it be able to do so at a profit. That, of course, is the key. If Tesla can't turn a profit on the base Model 3, then other parts of its story are at risk of falling apart. For instance, the Model Y would become a concern, even though production is most likely about 20 to 24 months away. It will also leave Tesla in a precarious financial situation, particularly with the resources it will need to devote to various projects over the next 12 to 36 months. Over the last few days, Tesla changed up its website and implemented a new ordering system rather than simply taking reservations. That's a positive step, as new customers can simply go to Tesla's site and place an order. Depending on what model they order and what features they want, the cars can be ready for delivery within four to six weeks. That's actually pretty impressive and shows how streamlined the factory has become. However, there was one noteworthy change in regards to the Model 3. Where it once said, "Designed to attain the highest safety ratings in every category, Model 3 achieves up to 310 miles of range while starting at only $35,000 before incentives." The vehicle's tag line is now simply, "the car of the future." It's not clear what this means. It's obviously not an admission that the $35,000 price tag is off the table. But it's sort of like leaving a family event without saying goodbye. It just feels weird. Why would Tesla go through the effort to remove all references to the base Model 3 costing $35,000? Granted, the version isn't even being produced yet, but nor was it when the original message was up and running. 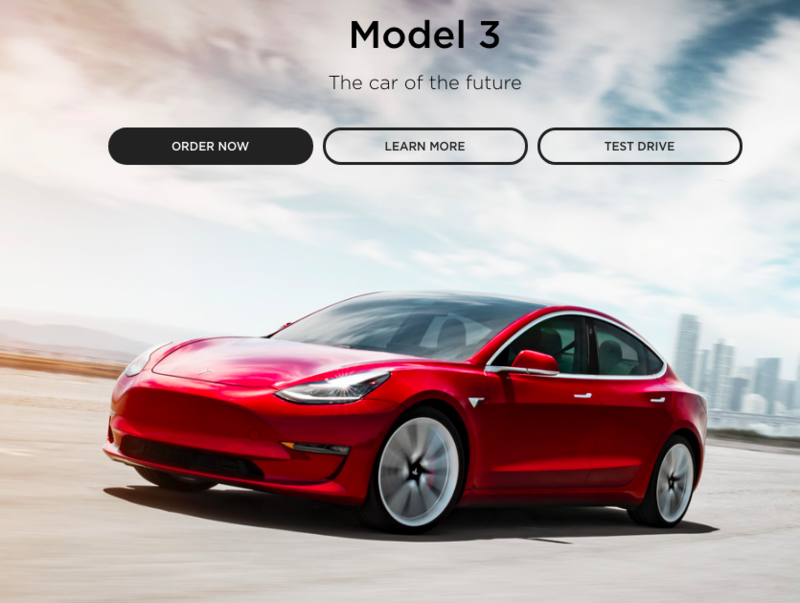 If one were to give the benefit of the doubt to Tesla, they'd argue that the new site looks cleaner (it does) and the "car of the future" tag says it all; in its enigmatic form it tells us the Model 3 is the car of the future for its safety, for its range and finally for its price. The skeptic, for which there are plenty when it comes to Tesla, would argue that the passive move suggests the $35,000 version is off the table. Or at least, no longer a pricing point management wants to firmly stick too. During Tesla's annual meeting in June, CEO Elon Musk said development for the smaller battery pack that will be used in the shorter range base Model 3 should begin later this year. Production of this vehicle should then begin in the first quarter of 2019. It makes me wonder how many orders the company has for the long-range version of the Model 3, the only model it's producing at the moment. It also draws the question of how many customers are in the reservation queue solely for the base Model 3. Worth mentioning is that there are roughly 420,000 net reservations currently on the books. If the number is high, say half, then Tesla could face a number of cancellations if it's unable to produce the base Model 3 for $35,000. At this point, there's no telling how many reservations are for the base Model 3 and how many of them would actually cancel their reservation. If they do cancel, Tesla has to refund the $1,000 payment each customer made. One last consideration? "Before incentives." On the first snapshot above, Tesla said that the Model 3 starts at $35,000 before incentives. Those incentives are about to change, though, as Tesla ships its 200,000th vehicle in the U.S. Through the end of the year, the $7,500 tax credit will remain in place for consumers. In the first half of 2019, though, it will drop 50% down to $3,750, before falling to $1,875 in the second half. After that, it's gone. With the base Model 3 scheduled for production in the first quarter of 2019, a vast majority of these cars will likely miss the full federal tax reduction. If Tesla is able to produce the base Model 3 for $35,000, the federal tax credit may not play much of a role in its demand. After all, $35,000 is rather reasonable for a vehicle to begin with, let alone one that boasts the Model 3's features. Although getting down to that price point could be a challenge.